Almost forty years ago, in 1977, a group of collectors founded the Associazione Collezionisti Piatti del Buon Ricordo with the intent to unite those who for 13 years had been travelling through Italy in search of Buon Ricordo plates. Now as then, the Associazione wants to promote and share the passion for collecting Buon Ricordo plates as well as the culture of Italian cuisine and its traditions. Becoming a member of the Associazione has many benefits: we provide comprehensive information on all plates and offer exclusive advantages that only Soci can enjoy. Above all, though, you will be able to share your passion with your fellow members. 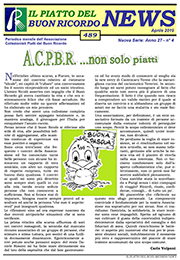 Complete monthly news (12 pages) are sent only to the members of the Associazione. Sunday, June 19th 2016 was held the he election for the renewal of the board of our Association. The place chosen for the meeting was already known for a variety of events of great success: the restaurant "Trattoria Guaiane" in Noventa di Piave (VE) where the elections had place combined with the usual banquet. To mark the occasion a commemorative plate was honored for all the participiants. This year the banquet for the fifteenth edition of "Italia a Tavola" was held on Saturday 6th October and Sunday 7th October at the restaurant "Davide dal 1955" in Porto San Giorgio (FM) and had as its theme "Le Marche - Dal mare ai Monti Sibillini". We met again for another pleasant meeting between friends and collectors to witness our closeness to the population of the provinces affected by the earthquake of 2016.
active, as a meeting-place to exchange ideas, experiences and opinions between the members. We talk about Buon Ricordo Plates, Buon Ricordo restaurants and obviously about good cuisine, tourism a much more. Access to the Forum is restricted to members regularly enrolled to the Collectors Association. Keep the feasts dedicated to CHRISTMAS GREETINGS with the theme of the masks of the main Italian regions, which began in 2011 with Piedmont. The mask chosen this year to celebrate the anniversary of Christmas was "Bartoccio", a traditional mask of Perugia. From 24 November to 16 December, seventeen banquets were the frame for a party became a tradition for all collectors. A page dedicated to all special plates by Associazione Collezionisti issued for anniversaries, assemblies, elections or other events. All dates and locations for future convivial meetings organized by our Association.